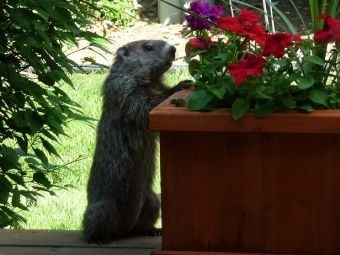 This week on the Vermont Garden Journal, Charlie Nardozzi addresses one of the most persistent of pests; the woodchuck. Tune in Friday evening and Saturday morning for a no-nonsense approach at ridding your landscape of woodchucks, and glean some helpful hints to get your peeking plants to buck up. I’m Charlie Nardozzi and this is the Vermont Garden Journal. How much wood could a woodchuck chuck if a wood chuck could chuck wood? I don’t know. But they sure can chuck a lot of my beans, greens, flowers, and carrots. The woodchuck, groundhog, or whistling pig lives in burrows near open fields or woody edges. They also can take up residence under a porch, wood pile, or deck. Out in an open field they won’t cause much damage, but if they find your garden, watch out. When my daughter was younger we had a baby woodchuck in our yard and she begged me not to bother it. I didn’t, but as it grew fat, our summer garden grew thin. If you’re going to coexist with a woodchuck, be ready to plant things they won’t eat, like tomatoes and garlic. To control the occasional visitor try repellent sprays such as cayenne or garlic. However, to really get rid of woodchuck you’ll need a fence or a bomb! Build a fence 3 feet tall and buried 1 foot into the ground. Curve the in-ground portion of the fence to an L shape pointing away from the garden and bury it. Above ground don’t attach the top 1 foot of fence to the poles. When the woodchuck tries to dig under the fence they’ll hit the buried part. If they climb up, the wobbly fence top will drop them back to the ground. If you really have a pest woodchuck, try carbon monoxide bombs. You’ll need to find all the holes, seal them and place the canister in the holes to kill them with this gas. Don’t use the bombs near living areas or buildings with combustibles. Live trapping isn’t encouraged because often a new woodchuck will just move into the area where your trapped woody lived. Now for this week’s tip, are your vegetables and flowers looking a bit peeked? Give them a spray of fish emulsion or compost tea fertilizer to green up the leaves and help them grow. Next week on the Vermont Garden Journal, I’ll be talking about the elderberries. For now, I’ll be seeing you in the garden! When the grey clouds are looming and icicles hang down from the eaves, it’s nice to have a green plant on your windowsill. We’ll learn how to grow salad greens indoors, and how to keep your potted plants thriving.